Partly because this film seemed so quintessentially Texas, I couldn’t help thinking it was a toned down version of another Best Picture Oscar winner No Country for Old Men (2007). With last year’s Best Picture Oscar nominee, The Big Short (2015), showing how many honest Americans were swindled by the greed of banks, it’s no wonder that this year we would see the more down-to-earth side of this financial fiasco. Not only are these robberies meant to save their home, these brothers also wanted to “stick it to the man” that put their family in such dire straits to begin with. In the end, Hell or High Water is a pretty standard plot and it’s pretty predictable from the beginning to the credits. However, when the citizens of these towns aren’t concerned that their banks are being robbed and they begin to side with the robbers, you know there’s something wrong with the society. Granted, this society in Texas was hit hard by the recession, so it’s no wonder that they don’t trust the banks that are being knocked off. It’s realizations like this that help to show why a presidential candidate practically backed by big banking did not win last November. 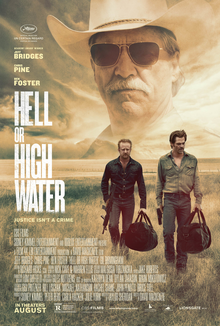 A modern twist to a standard bank heist archetype, I give Hell or High Water 4.0 stars out of 5.